Candidates running against Alderman John Arena (45th) in the Feb. 26 election have said that they would swiftly inform ward residents of zoning proposals and that meetings of advisory boards should be open to the public. Meanwhile, Arena said that his ward advisory committee, whose meetings are closed to the public, provides valuable expertise in areas of urban planning and architecture and that his zoning review process has resulted in new development of parcels which have in some instances been vacant for more than 10 years. 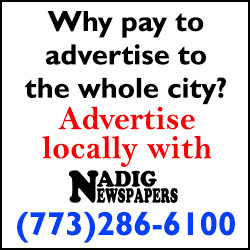 Nadig Newspapers recently asked Arena and his challengers Jim Gardiner, Marilyn Morales and Robert Bank to explain how input should be gathered on zoning proposals. They all also discussed the mixed-income housing development at 5150 N. Northwest Hwy., the 16-story mixed-use building at 4849 N. Lipps Ave. and the 10-story senior housing complex at 4747 W. Irving Park Road. "The problem with 5150 was how this came about," said Chicago firefighter and part-time schoolteacher Gardiner. "My goal is to be as open and transparent as possible. 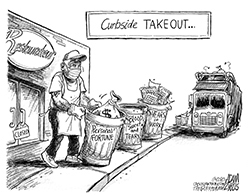 The number one thing (residents say) is they feel their voice is not being heard." Initial plans had called for only a self-storage warehouse on the site, but Arena had the property downzoned to stop that plan, and the developer then sued the city. The lawsuit resulted in a settlement agreement in which Arena agreed to support rezoning the parcel to accommodate both a storage warehouse and an unspecified housing development. A couple of days later Arena announced a plan to build 100 apartments, later reduced to 75, which would include a mix of market-rate, affordable and Chicago Housing Authority-subsidized units on the site. Chicago Park District regional manager Morales said that many residents feel they were kept out of the decision-making process given that the alderman had never held a community meeting on the downzoning in 2016 and that the community meeting on the housing proposal in 2017 was held in too small of a venue, as hundreds, including herself, were not allowed inside the Branch Community Church, 6125 W. Foster Ave. "This is a lack of leadership on his part," Morales said. Morales charged that Arena’s actions regarding the housing proposal have created division in the ward, pitting neighbors versus neighbors. "We wouldn’t be where we are at without his divisiveness," she said. "This is all on him." "I’m 100 percent against 5150," said Bank, the former Jefferson Park Neighborhood president. "This development concentrates all the poverty into one building." Bank said that Jefferson Park is one of the most affordable neighborhoods in the city, with rents as low as "$600, $800 (for studio and one bedroom) and $1,000 for two bedrooms" and that there are better ways to integrate low-income families into the community than constructing large housing complexes, noting that existing landlords can accept CHA rent vouchers. Both Gardiner and Morales said that there is a need for affordable housing in the ward. Morales said that additional affordable housing could be created without building "monstrosities," while Gardiner said that any housing development should be marketed in a way that would benefit existing ward residents. Alderman Arena said that while the law prohibits a local preference for the building’s tenants, the 5150 developer will be marketing the units to the community and that he expects local veterans and residents with disabilities to occupy a significant portion of the seven-story building. "We have 130 people on a waiting list, (and) 80 percent are from the 60630 ZIP Code," Arena said. "The organic result from the marketing plan is you get people from the community." Arena said that while his advisory meetings are private, he regularly holds community meetings on zoning proposals and that residents are invited to discuss any concerns with him during his ward night on Tuesdays. Arena said that the advisory committee meets on an ad hoc basis and that all members live in the community. He said that the committee is not a decision-making body and that the group’s advice has led to more aesthetically pleasing buildings. A variety of factors go into zoning decisions, including the market restraints that can impact what a developer can build, and there will almost always be some opposition to a zoning proposal, Arena said. "We can’t operate on a 100 percent principle, and we have to operate on majority rules," he said. In some instances, Arena has waited a year to notify residents of a zoning proposal that he and the advisory committee have been reviewing. Arena said that proposals can go through significant revisions and that some developers are slow to provide all of the information and documents that he requires – a zoning review process that he said is outlined on the ward’s Web site at ward45.org. Morales said that she would form a zoning advisory group for each section of the ward so that residents living closest to a development site would have the most input and that the meetings would be open to the public. Gardiner said that he would have a ward advisory board with one or two representatives from each section of the ward and that meetings would be open to the public. He said that he would work with the ward’s community groups to elect the board’s members and work toward a general consensus on proposals. "My goal (is) to be a voice for the people of the ward," he said. Bank said that he would work with the existing community organizations but that zoning changes in the ward would be "rare." He said that while some increased density is needed at Six Corners, he feels the best way to revitalize the business districts is to fill the existing vacant storefronts and to recruit businesses looking for office space. Meanwhile, two other prominent zoning projects in the ward are the construction of a 16-story building with storefronts, a 200-sapce parking garage and 114 apartments next to the Jefferson Park CTA Transit Center, 4917 N. Milwaukee Ave., and a proposal to build a 10-story complex with an Aldi grocery store and luxury senior housing. The three challengers said that that the 16-story building would be too tall and that the projected rents for the senior building, starting at $4,400 a month, are too high for the typical senior citizen in the ward. Plans call for the developer to build 11 affordable units for seniors at an off-site location within a two-mile radius of the main development site. The developer has said that it would not be feasible to include units with rents as low as $800 or $900 in the main building. Arena said that the developer is reviewing several locations for the off-site units and that they most likely would be constructed inside an existing building which the developer would purchase and rehab. The developer had been exploring the possibility of putting the affordable units at the convent at Saint Cornelius Church, 5430 W. Foster Ave. but that no longer appears to be a possibility, Arena said. Arena said that the senior project is an example of how market conditions can affect a proposal as initial plans for only a one-story retail center there had to be scrapped. "Some density is needed to help revitalize the business districts, but I think 16 stories is too high," Gardiner said about the apartment proposal. The building would be located behind the 10-story Veterans Square at 4849 N. Milwaukee Ave.
Bank said that the project’s parking garage could worsen commuter traffic in the area. "I don’t want Jefferson Park to become a parking lot for the people of Niles," he said. Bank added, "(The senior project) is too high and it doesn’t belong in a retail shopping district." Morales said that development should follow the recommendations in the master plan which has been developed and that the "high-end" nature of the senior project does not fit in with the area’s affordable housing needs for seniors. The Six Corners Master Plan calls for a four- or five-story building where the senior building is proposed. Arena said that when he was first elected in 2011, the community’s top priority was to bring economic development to the ward and that 8 years later there are several "developments that are going into the ground" and that "we have robust dialogue on these things." 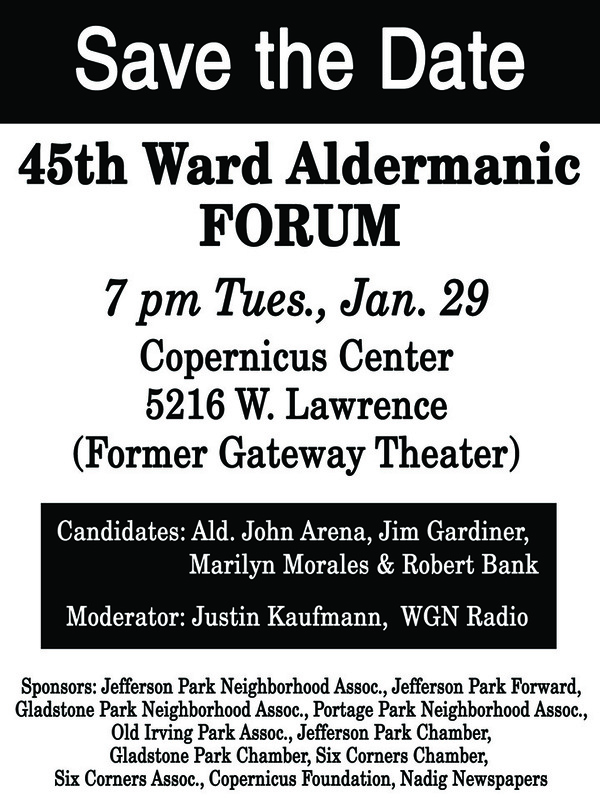 A 45th Ward aldermanic candidate forum will be held at 7 p.m. Tuesday, Jan. 29, at the Copernicus Center, 5216 W. Lawrence Ave.